An escaped convict accidentally destroys a stunt shot while a movie is being filmed. When the driver dies in the subsequent car crash, the director of the film decides to quickly replace the driver with the convict, thus saving them both from the police and setting up explosive dramatic ironies between the real world and the illusory world of film-making. O'Toole & Railsback are brilliant in this brilliant cult classic film. Action-adventure. Comedy. Suspense drama. Social satire. Romance. The mixed blessing inside Richard Rush's 1980 genre-scrambler The Stunt Man is that the movie is a rich quarry of all of those things, yet isn't solidly petrified in any of them. Add a layer of existential exploration and you have a thinking person's action film that defies casual description. On its surface The Stunt Man is a brash and stylish dark comedy built on a "man on the run" premise. Deeper layers expose the porous tissue between reality and illusion, and the paranoia generated by our inability to control either one. No surprise then that the studios didn't know what to do with it, and (according to Rush) forces and egos within "the system" were actively antagonistic to the finished product. 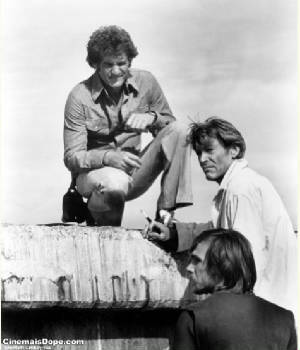 The Stunt Man's distribution was strangled at birth, and even the single screening for Academy members was clouded by foreboding technical problems. Says Peter O'Toole on this DVD's commentary track: "The film wasn't released, it escaped." 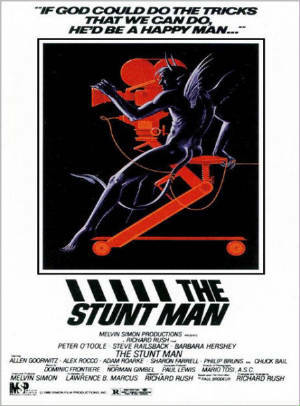 That's too bad, because although it's show-offy about its cleverness — sometimes to the point of overkill — The Stunt Man remains one of the more interesting and extraordinary movies that kicked off the Reagan administration (an era when reality and illusion became officially interchangeable). Because it was released to only eleven cinemas, it didn't get the chance to attract the attention it, mostly, deserves. Since then it has ascended to "cult" status, this being one of the rare cases in which that status is earned on the objective quality of the film's components. At the 1980 San Francisco Film Festival, François Truffaut was asked to name his favorite director. He replied, "I don't know his name, but I just saw his picture last night. It's called The Stunt Man." Set in the world of movie-making itself, The Stunt Man opens with the chase already on. Fugitive criminal and Vietnam vet Cameron (Steve Railsback), on the run from the police and FBI, stumbles onto the set of a World War I movie in production. Causing (perhaps) the death of the leading man's stunt double, Cameron is literally descended upon by flamboyant director Eli Cross, played by O'Toole. (He tells is in the commentary that he based Cross on David Lean, who had directed him in Lawrence of Arabia.) Imperial, charismatic, manipulative, possibly bonkers, and beloved among his crew, Cross offers Cameron a bargain worthy of a wanton Greek god — he will give Cameron sanctuary and anonymity if Cameron agrees to take the place of the original stunt man. Cameron agrees, and soon he begins a physical transformation at the hands of a makeup artist, in addition to deeper transformations influenced by Cross and the picture's leading lady, Nina (Barbara Hershey), with whom Cameron quickly and naively falls in love. Cameron is bedeviled by combat-vet paranoia, questioning what is real and what is make-believe, and soon he wonders if Cross, Nina, and others are conspiring against him. Is Cross out to capture Cameron's death on film? Cameron has reason to believe so — and because almost the entire story is told through his eyes and perspective, so do we. From this axis spins a comic story about the shifting boundaries between what's real and what we just perceive. Rush's The Stunt Man and Cross's film-within-the-film mirror each other, so even we in the viewing gallery aren't immune to manipulation. The Stunt Man is also about transubstantiation and the power that wills it. Cross is deus ex machina personified. Ascending and descending on his "killer crane," he is a larger-than-life god of the filmmaking machine, dispensing truth and illusion and identity for his own purposes. Water is said to have become wine without special effects, and the utter transformation of Cameron (camera on?) is all in a day's work for Eli Cross. "If God could do the tricks that we can do," Cross intones, "He'd be a happy man." Despite its occasional dips into high-horsiness and a certain pomposity, what makes The Stunt Man work is that it's so enjoyable. The sharp screenplay moves briskly, the performances are engaging, and Rush trapezes between exclamation points with a directorial flair that he hasn't come close to matching since. The Stunt Man rewards close attention, and when watched a second time clever details of dialogue and camerawork reveal themselves and our perceptions are again quarter-turned like a Rubiks Cube.